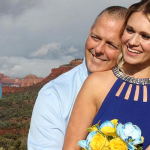 Rick Dennison recommends Sedona Destination Weddings. Our wedding was just beautiful!!!! Our ceremony and photographer worked well together!!! 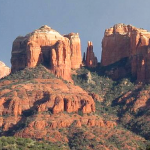 We would recommend Sedona Destinations to everyone. Thanks again. 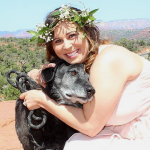 Jackie Rindone recommends Sedona Destination Weddings. 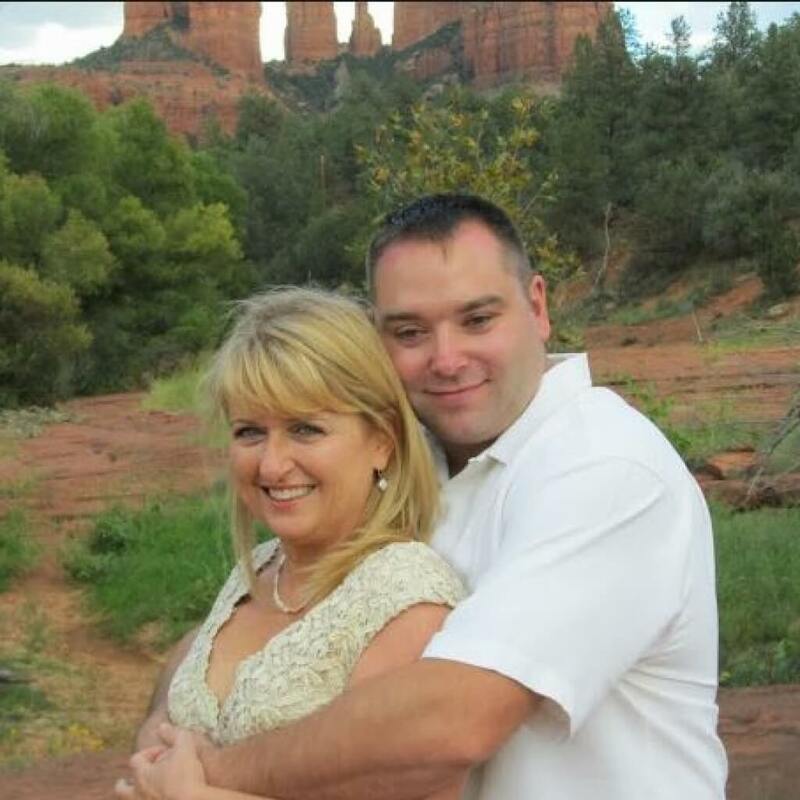 My husband and I married a month ago, and Sedona Destination Weddings was a joy to work with for the entire process. From inquiring on packages to the ceremony, they were communicative and helpful. My partner and I were committed to having a low-key ceremony with family and close friends, and the ceremony went perfectly. 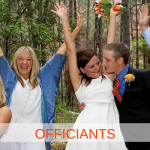 Sedona Destination Weddings will help you pick a site that accommodates your needs with the size of the group. They also have numerous options for ceremony and vows. My husband is Indian and I am from America, so it was lovely to blend both of our cultures. 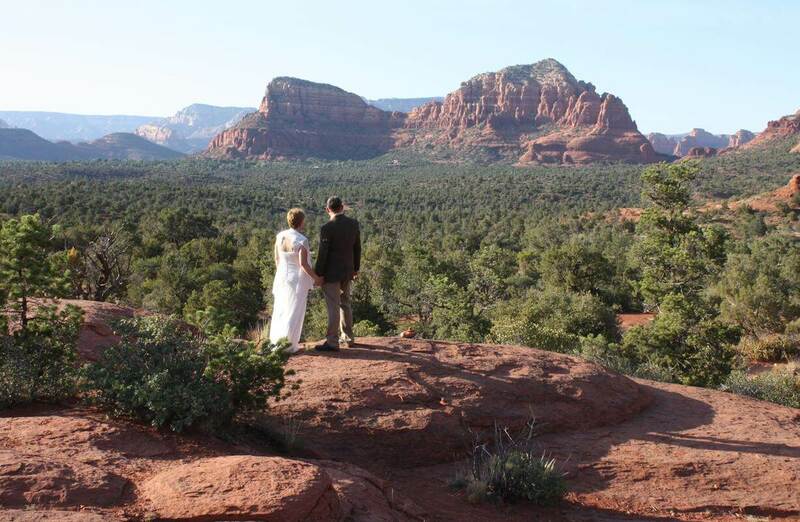 If you are looking for a wedding that incorporates the beauty of Sedona, we highly recommend! 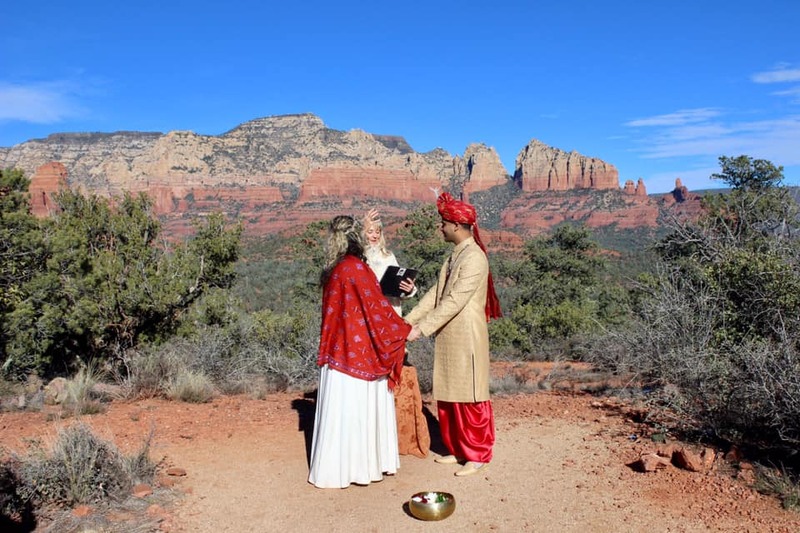 Our experience with Sedona Destination Weddings was simply outstanding, and we thank them for everything they did to make our wedding day the most special day of our lives. Iala and her team were amazing to work with from the moment we contacted them to talk about a wedding package. They were always very responsive to our questions, and Iala was simply amazing to work with when we became worried that the weather would make the original site we selected for the wedding less than optimal. The alternate location she suggested was beautiful and everything came together to make it the perfect moment in time. Reverend Yana was amazing, and the ceremony was absolutely magical; we could not have asked for a better officiant or a more magical ceremony. The team made sure to take care of everything we needed to make our day memorable and wonderful. They made everything so effortless to the point we didn’t have to worry about anything. 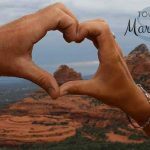 We would whole-hardheartedly recommend Sedona Destination Weddings to anyone looking for the perfect Sedona wedding experience. Thank you from the bottom of our hearts and many blessings to all of you! Absolutely amazing to work with! Highly recommended if you’re planning your Sedona Destination wedding – such a pleasure being a part of your events. Thank you again & until next time! 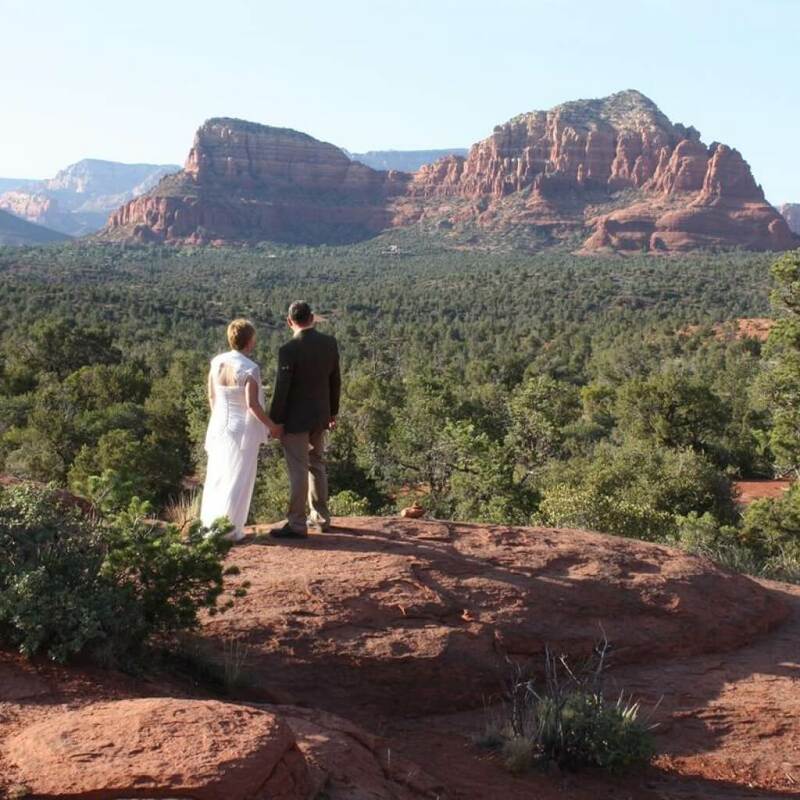 Phyllis Leard recommends Sedona Destination Weddings. Thank you for making our day special. Rev Scot was great and made our ceremony more than we expected..Our photograper Stacy Burk was the very best and we can not wait to see our photos…They all made our moment in time the best for us…Thank you all !! Everything from start to finish was a breeze, and our wedding was everything we wanted and more! The site was beautiful, the ceremony absolutely perfect, and the entire wedding team was so professional and helpful and made us feel entirely at ease. We received the pictures yesterday, and WOW, they are fantastic! The colors are so vivid! On a side note, we originally considered a sunset ceremony and were advised that the monsoon season could be a bit unpredictable, so we chose a morning ceremony. Sure enough, it poured later that afternoon! Very thankful we didn’t have to trudge through the mud and rain! LOL! 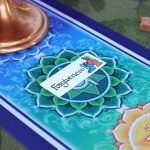 The whole experience was entirely stress-free working with them, and I would highly, highly recommend them for a truly unique and beautiful experience that you will remember for a lifetime!! Amazing experience and I couldn’t have chosen a better company or setting for our ceremony. Completely stress-free process working with them to coordinate our elopement in Sedona for August 2018. I reached out to them about a month before our trip to coordinate one of their elopement packages and they easily squeezed us into their schedule at our favorite location. Their provided officiant, witness, and photographer (Yana, Kenyon, and Stacy respectively) were phenomenal. 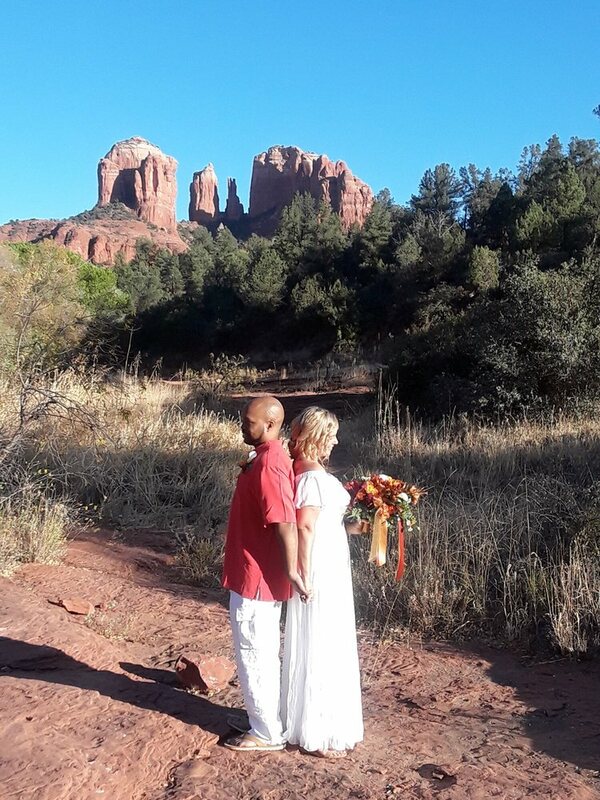 The photos came out magnificent and the photographer, Stacy, was very talented and knew exactly the right spots to capture the beautiful sunset and mountain back drops in Sedona. We received the photos on CD via mail about a week after the ceremony. Yana was a magnificent officiant and she truly catered the ceremony to us. The whole experience was just spectacular and perfect for us. 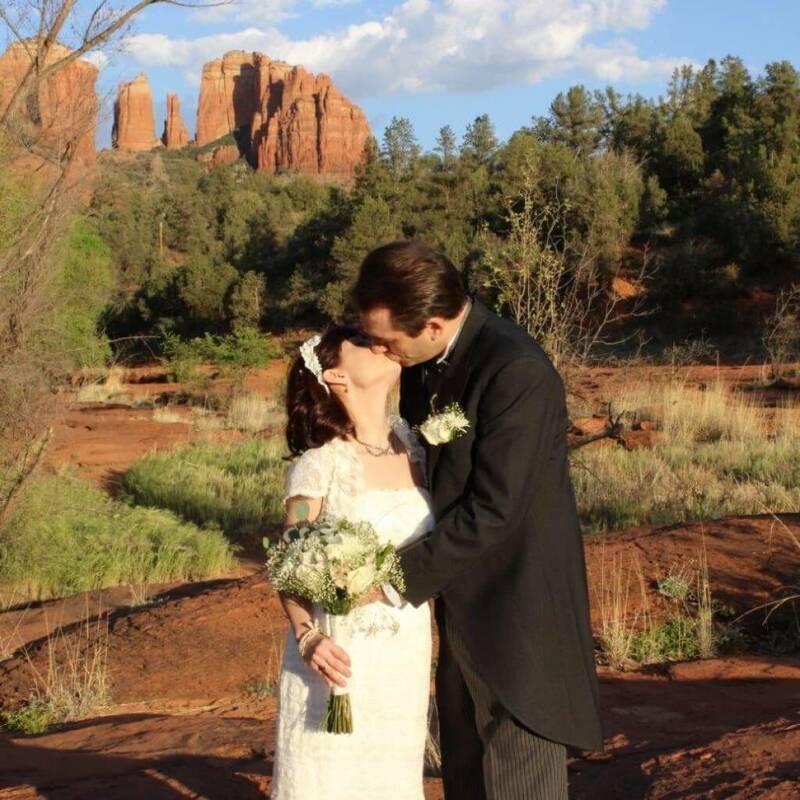 Thank you Sedona Destination Weddings for making our day so special. Would definitely recommend them for anyone organizing a wedding in the Sedona area. After 20yrs we finally got the wedding we always dreamt of. Words cannot express how grateful we are that we . Thanks to everyone for giving us such a beautiful day! The pictures and Keepsake video were breathtaking as well the the site, Lover’s Knoll..
I’ve wanted to review Sedona Destination Weddings since my wedding last July but could not find the words. I find myself getting the chills as I type. Nothing seemed to line up for our wedding. We found ourselves beyond stressed and I fell ill so we eloped in Sedona. One of our favorite places in the world. We eloped in July and arrived a few days early. Everyday we got thunder and lightning between 4-5, the time we were scheduled to marry. The weather called for thunder and lighting when we were to get married and it seemed to be guaranteed. The contract clearly stated we needed to find an indoor location for the wedding. We were staying at the Hilton and hoped to find a place there. But the devastation of coming to Sedona to marry inside. Argh, we could see bell rock from the window and it taunted us. We were told the chance of the wedding happening were low, but they would not cancel until last minute. Last minute we did receive a call asking if we were willing to try Huckabee instead of Bell Rock with the notion it may still be canceled. We said yes. When we arrived at Huckabee it was sprinkling. It was 3 minutes before and no one was there. We felt so anxious. Then everyone arrive. One witness jumped from her car to pray for the clouds to stop. I swear, they did. It’s like they froze in place. Our officiant greeted us with Pink Floyd and George Carlin quotes. The other witness predicted our Dosha’s to a T, something that actually benefitted us beyond the wedding. Everything was magic as we eloped. The air, the slight wind, the warmth, the colors, the team we were given. Though we were alone we felt like the world was watching. It felt as though the team knew us. It was perfect. The moment we finished the rain and lightning began. We are thankful for everything. Sedona Destination Weddings provided a service we refuse to believe we could have received anywhere else in the world. Thank you for the happiest hour of our lives! 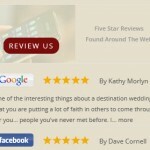 I don’t know how helpful this review is but I really wanted to express our thanks to Sedona Destination Weddings. My husband, family, and I had a fantastic experience with this company. Of course, I had a lot of questions to ensure the day was perfect. 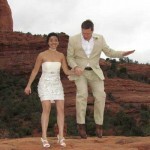 Sedona Destination Weddings always got back to me right away and answered all my questions. At the ceremony, the minister and photographer gave great tips and helped us every step of the way. They recommended the perfect time for the wedding (the lighting was PERFECT). The photographer came up with adorable poses and made sure everyone looked their best for each photo taken. I can’t wait to see the pictures!! Our minister was amazing and truly brought the spiritual aspects of Sedona to life. 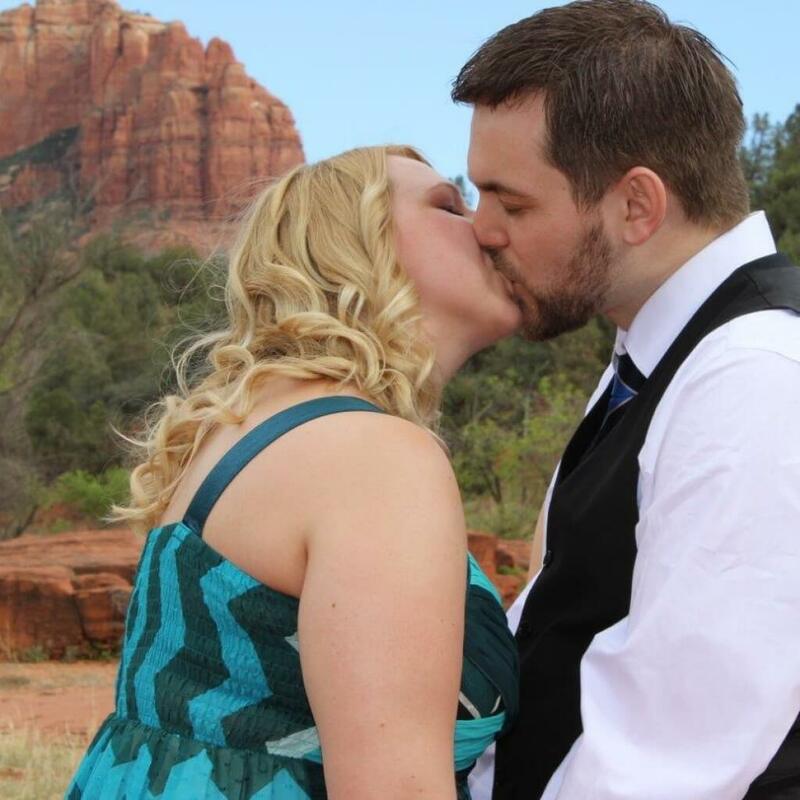 It was the perfect day, and we couldn’t have done it without Sedona Destination Weddings!! Update: Got my photos in little over a week and they were FANTASTIC! The photographer captured our day perfectly! There were so many wonderful photos to choose from. 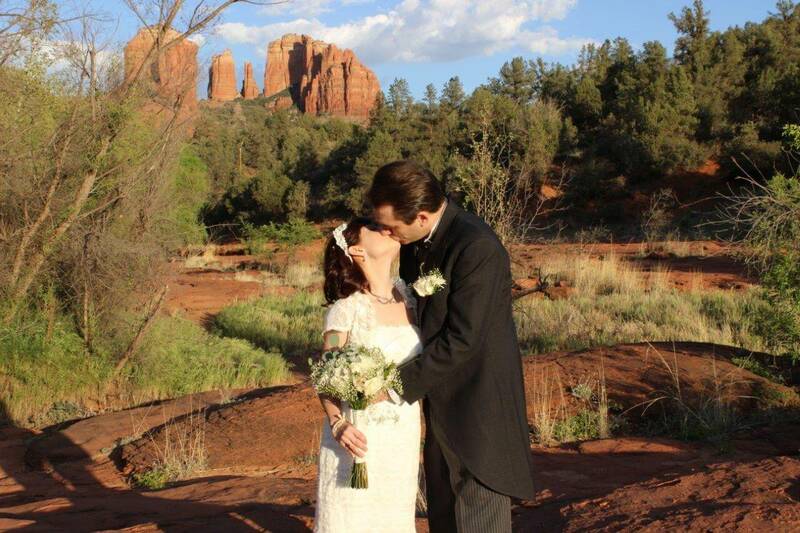 Thanks again Sedona Destination Weddings for an unforgettable wedding day! 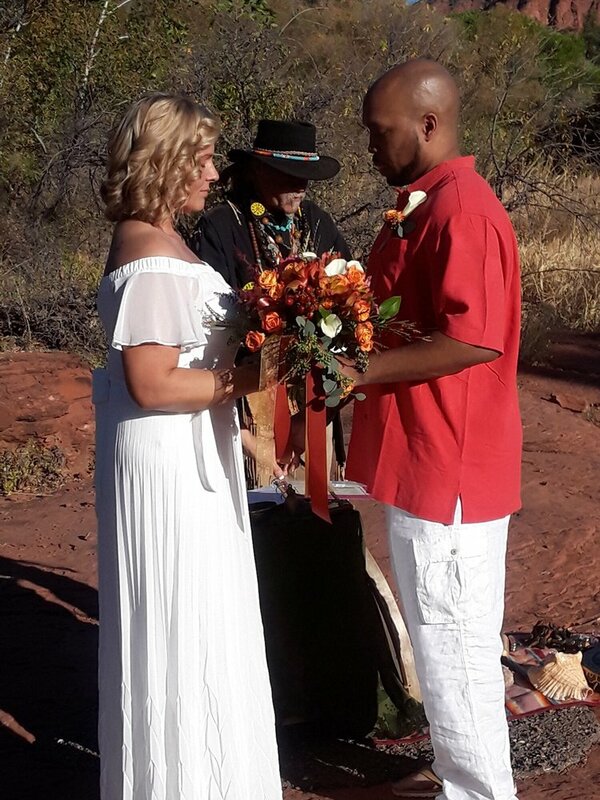 My husband and I wanted a wedding experience that was spiritual and had the beautiful Sedona scenic mountains for our wedding ceremony site. 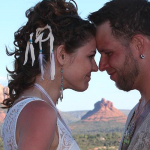 The initial planning and up to the wedding day was effortless thanks to Iala Jaggs and Sedona Destination Weddings. Reverend Scott gave us the peaceful and meaningful ceremony including playing the native american flute which added a special touch. Our wedding site coordinator was very efficient and kept our little crowd well organized. 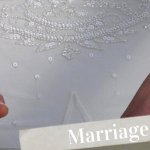 The photography was amazing and I have already received rave reviews from family and friends I have shared our video keepsake and photographs in which we received promptly after wedding. 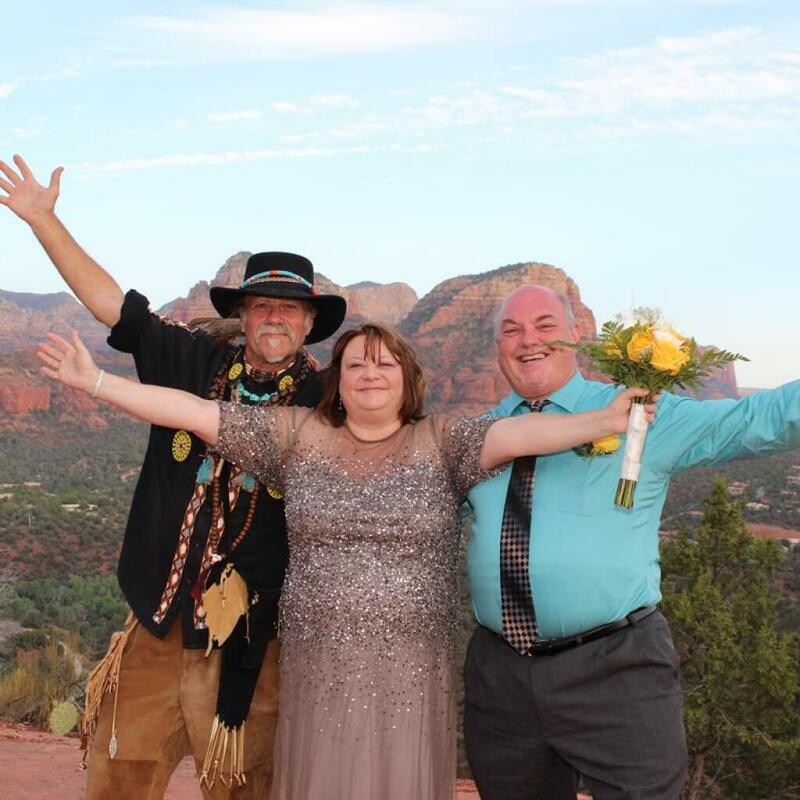 I have already referred to two of my friends who are planning a Sedona wedding to contact Sedona Destination Weddings as we were so happy we chose them for our special day! My fiancée and I fell in love with Sedona last year, and when we decided to get married, knew this was the place. I did TONS of research, and kept coming back to the same place. On a whim, I emailed Iala to see if there was a possibility of a short notice vortex/wedding site tour, to get a feel for WHERE we called to have our ceremony. Within minutes, she responded and we set up a same-day tour. Our guide arrived promptly, and we set off on our quest for the perfect spot to reveal itself to us. Everything about our tour just “fell into place”. There are no words to describe how “right” everything feels, and the guidance that Sue Ellen gave us during our 2 hours together just solidified what we felt to begin with: we would be in good hands with our special day. We begin our planning today with no anxiety or stress. We will update after our ceremony, but my gut tells me it will be a day of love, peace and blessings. UPDATE: We had our wedding on Wednesday and it was everything we imagined. The day, the setting, the peace of it all was perfect. 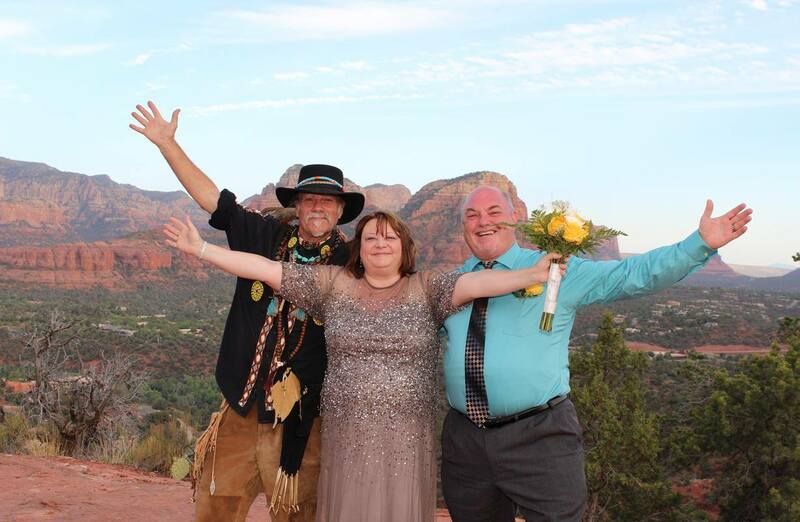 As we thought 9 months ago…..Sedona Destination Weddings is the way to go. There was no stress, no ambiguity about what to do or expect, and none of the crazy, last minute detail worrying that robs the bride and groom of peace on their day. We live in Texas and had never been to Sedona, but after seeing how gorgeous it looked we decided it would be the perfect place to elope to. Only problem was we knew no one there! I found Sedona Destination Weddings through a Google search. I browsed their website and read the reviews before deciding to take a chance with them. About 2 months before the date we wanted to get married we called and got everything set up. 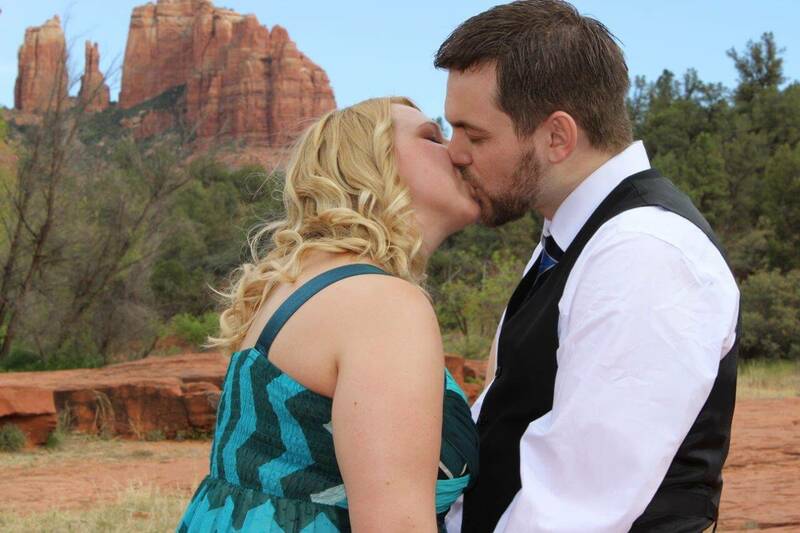 We chose the Sweet Sedona elopement package at Red Rock Crossing. The wedding turned out beautifully and we love our photos and video! Thanks for making our dreams come true! My husband and I eloped with one of Sedona Destination Weddings packages on Dec 30, 2016. We did the Crystal Vortex Package and it was AWESOME. We had such a special and unique experience and I haven’t ever heard of a wedding service like it. Our whole crew (Scott, William and Aurora) were so kind, flexible and easy going – particularly since it was just the two of us, our 12 week old baby and our Pomeranian 🙂 we had to improvise a lot through out the ceremony and everyone was so awesome about just making it work! We received our photos in the mail today and they are lovely! I saw other reviews complaining about the photos, but we were told up front they would be taken by an in-house photographer, not a professional. Our pictures are great! The scenery is beautiful and it captured the essence of our special day. I laughed and cried flipping through the photos. This was such a special day and I wouldn’t have had it any other way. Huge thank you to Iala as well who got us all set up quickly when we booked the ceremony just a few weeks prior to arrival in Sedona! So helpful and kind. Thank you! Amazing from start to finish. My wife and I had been in contact with Iala for months who kept us apprised of all the details. We chose Lovers Knoll and couldn’t have been happier. Our officiant was Akal and the Shaman ceremony was beautiful and captured the spirit we were looking for. Both Akal and Scot the photographer recognized our quirky nature and made the ceremony fun, but at the same time never lost sight of the importance of our big day and conducted the ceremony with respect for the old ways and nature which is what we had hoped for. Thanks to everyone. Blessings to all! 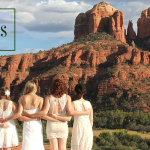 Sedona Destination Weddings has been officiating weddings in Sedona, Arizona for over a decade and has been reviewed by many of our clients over the years on many different review sites all over the web. 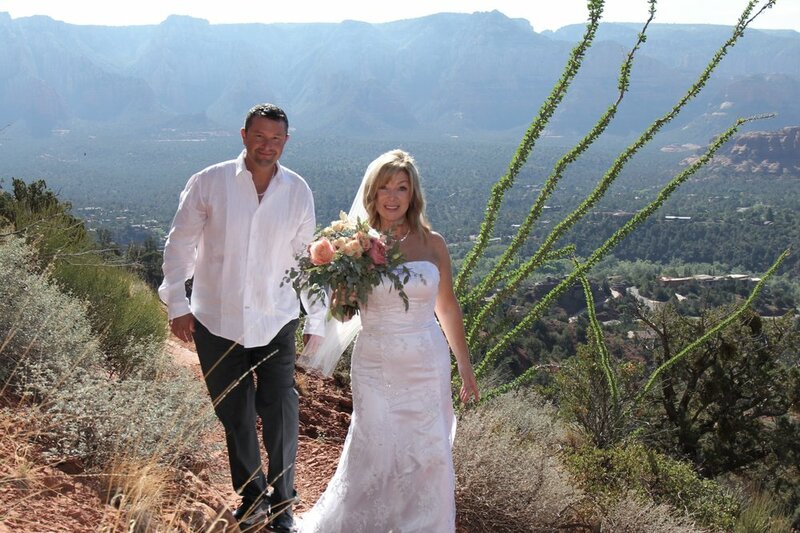 Connie Caudill left the following testimonial for us online… Sedona Destination Weddings provided a unique and stress-free experience for our amazing wedding. Tony and I were joined in marriage on June 10, 2014. It was a beautiful and magical experience at the Airport Vortex. We chose the Southwestern Elopement Package, and also took the Wedding Prep and Site tour. Reverend Akal was professional and charismatic, which made our perfect wedding even more enjoyable. The video and pictures were gorgeous. 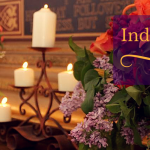 We plan on returning for a Vow Renewal Ceremony on our 10th anniversary! Thanks Connie! Rev. 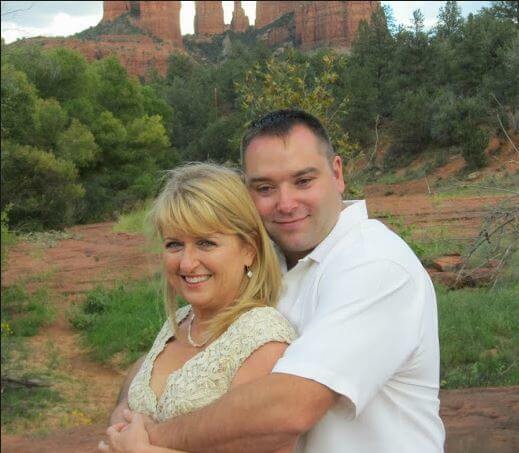 Patricia recently officiated the vow renewal ceremony of Bryan and Donna Tyrell at Bell Rock in Sedona, Arizona. Donna had this to say about their ceremony… “It was not what i expected. It was better than what I expected!!!! I would recommend your company to anybody.” Here are some of the beautiful photos of their vow renewal ceremony. We had a wonderful experience in all ways, everything from the location, the organizers to the pictures we got afterwards was perfect. We will definitely return to Sedona some time in the future to revisit the wonderful place we got married. –Anita Jensen Thank you, Anita…congratulations and many happy years to you and Jan!